17 End of School Year March for PEACE! Greater Auburn Gresham CDC Voices Opinion on Mayor's Top Cop, A Community Friendly Selection! 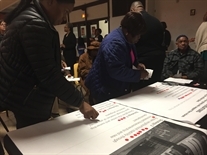 The Greater Auburn-Gresham Development Corporation (GADC) is no stranger when it comes to being a voice for the community and taking a strong stand for the safety of neighborhoods that makeup Chicago's police 006th district. It was good to open the doors to CBS Chicago's reporter Dorothy Tucker, and tell a heartfelt story of working closely with 006th district police, and it's good history under Commander Eddie Johnson. The communities of the greater Auburn Gresham area made sure their voices were heard, over the past six months. On March 10th, almost 200 in attendance casted early votes and thier selected community dream projects are spot on!